CONTRATACIÓN DEL SUMINISTRO DE UNA AMBULANCIA ASISTENCIAL TIPO C PARA EL SERVICIO DE PROTECCIÓN CIVIL. 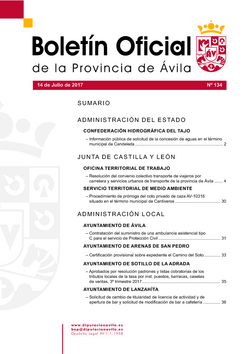 RESOLUCIÓN DEL CONVENIO COLECTIVO TRANSPORTE DE VIAJEROS POR CARRETERA Y SERVICIOS URBANOS DE TRANSPORTES DE LA PROVINCIA D EÁVILA. APROBADOS POR RESOLUCIÓN PADRONES Y LISTAS COBRATORIAS DE LOS TRIBUTOS LOCALES DE LA TASA POR INST. PUESTOS, BARRACAS, CASETAS DE VENTAS, 3º TRIMESTRE 20º7. INFORMACIÓN PÚBLICA DE SOLICITUD LA CONCESIÓN DE AGUAS EN EL TÉRMINO MUNICIPAL DE CANDELEDA. SOLICITUD DE CAMBIO DE TITULARIDAD DE LICENCIA DE ACTIVIDAD Y DE APERTURA DE BAR Y SOLICITUD DE MODIFICACIÓN DE BAR A CAFETERÍA.